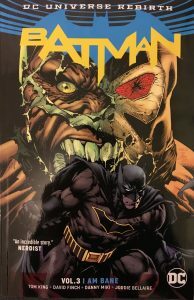 Volume 3: I am Bane is the third collected edition in the Batman Rebirth series. 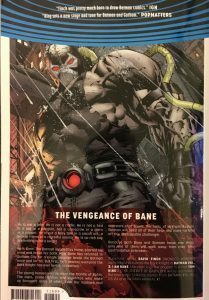 Beginning with the events which in I am Gotham and continued in I am Suicide, Volume 3 I am Bane showcases another huge confrontation between the Dark Knight and the formidable Bane. To date, I have not scored Tom King’s Rebirth run highly with Vol 1 scoring a 4/5 and Vol 2 scoring a disappointing 3/5. 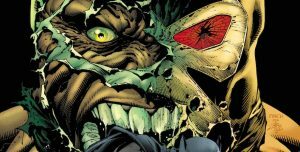 However, with an explosive premise and cameos from quite a few of Batman’s Rogue’s Gallery I am Bane is a completely different kettle of fish. There’s also a pretty huge cliffhanger once the I am Bane arc is finished! The premise of this book was/is huge. Bane’s back, he’s bigger than ever and he wants revenge after Batman stormed his prison in I am Suicide. 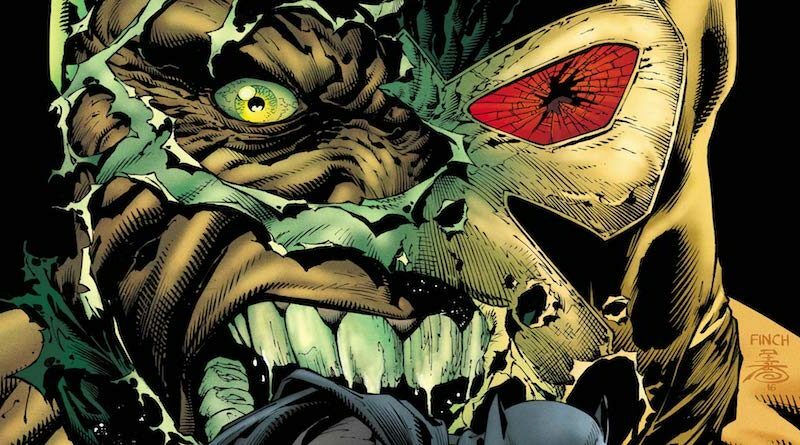 However, I was a bit wary that this has already been done in Knightfall where Bane famously ‘Broke the Bat’ – what can Tom King do with Bane that hasn’t been done before? In I am Gotham he introduced new characters in Gotham and Gotham girl (which I wasn’t over the moon about) but now he wants to use a tried and tested super villain and I was a bit nervous whether King could pull it off. Unfortunately, I don’t feel like he did. The opening issue is great but a little too silly – he pretty much gathers all the male members of the Bat-family to a Batman themed burger joint to let them know Bane’s coming and to stay away (how many time’s does he play that trick?!) because he needs to deal with it himself. 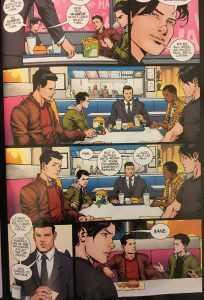 Despite being a light hearted setting and the boys messing around I felt that Bruce was too serious in the situation, King could have made Bruce lighten up a bit but chose not to. Too make matters even more bizarre, Batman sends his allies away but is happy to let the inmates of Arkham out to ‘help’ him (which they didn’t) out, making the usually precise Bruce a little haphazard. This also sets up King’s desire to build up Bane to be some invincible monster that only Batman can take him and he would kill everyone else if they tried, although possibly true, Batman would have had a much easier time of dispatching Bane with the help of his trained allies. This was probably King’s attempt at moving the plot along or maybe just to be able to have the story at all. Either way, it was a stupid idea especially when Bane himself brought his friends along. 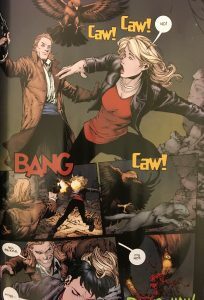 Bruce risks a lot to save Gotham Girl and to keep Psycho-Pirate away from Bane’s grasp; it almost felt like there was too much at stake here. 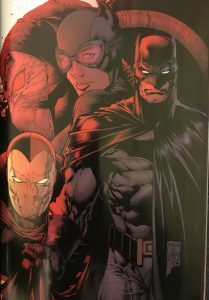 I found the Gotham Girl and Psycho-Pirate thing a little stupid in the first place and to see it dragged out yet again to be disappointing, I also found it a bit insulting that a master strategist such as Bane to go in full pelt without a real plan – in Knightfall especially he isn’t all muscle – he is a cunning villain who is able to think as well as hurt and his plan to get Pirate back was completely absent. 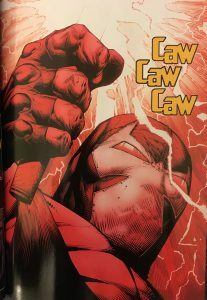 Repetition of catchphrases was present in the previous two volumes and in I am Bane we are subjected to it yet again as Bane himself utters the words “I am Bane” over and over again. We get it, he is a force to be reckoned with, but as stated previously he is not a mindless drone and I felt a character like Bane deserved a lot more respect than this. 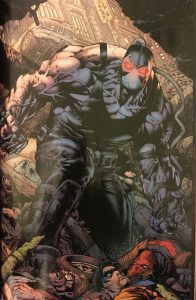 Bane may not be in my top villain lists but he is still a villain I enjoy reading about and completely understand he is in the upper echelon of villains in the Gotham universe. 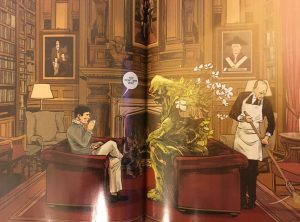 During the middle section, both Bruce Wayne and Bane’s childhoods are recounted side by side showing how similar they are and it appears as though both characters spoke to their deceased parents to help them through the trauma. I am not sure how I feel about this section as I am not sure if King is suggesting if they were literally speaking out loud to the deceased or if it was just there for effect. The fact that I wasn’t sure by the end of it is probably the reason I am not 100% loving it. Plus, I disagree with their childhoods actually being that similar other than the deceased parents thing. 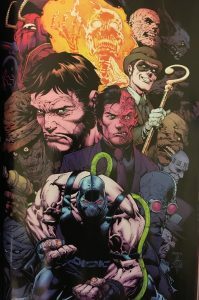 As the plot continues and the climax approaching, Bane smashes his way into Arkham and this is where I feel Tom King went really overboard building Bane up, in the space of an issue Bane beats up Two-Face, Scarecrow, Freeze, Firefly, Black Spider, Flamingo, Man-Bat, Zsasz, Hatter, Dr. Phosphorus, Hush, Copperhead, Calendar man, Riddler. Not all top-tier villains but there are some big names in there. Two-Face, Freeze, Scarecrow, Riddler and Hush being some of my favourite villains and they were just wiped out in an instant. Not a fan of that, at all even if some parts of it were humorous. He also says “I am Bane” a few times during all of this. What I did like, finally, was when Bane admits he was done with all of this (fighting, being in Gotham etc) as Psycho-Pirate had finally given him peace before Batman raids his place and taking it away. I really wished there could be more writing like this. 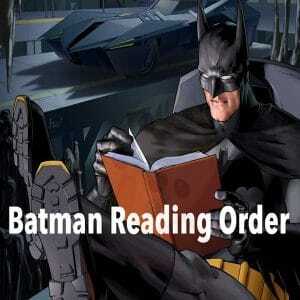 Anyway, after all is said and done Batman knocks him out with a headbutt. Often, characters have lacked rationale in their decisions and motives; when Bane explained how he had finally found peace and his rage was because it was taken away from it was like a breathe of fresh air as I thought “Yes, this now makes sense”. 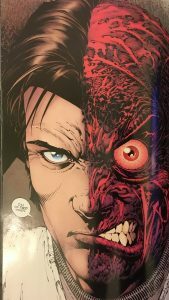 Once the I am Bane arc concludes Volume 3 has a few short stories added on and they were my favourite parts. The first is somewhat OK with an honest exchange between Gotham Girl and Batman about why they do what they do and whether they’re happy. It was OK. What I don’t understand is why Batman is so fascinated with her and willing to sacrifice so much for her, of all the people he’s met and cared for – why her? 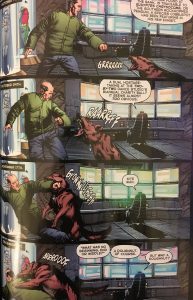 Then there’s a humorous re introduction to Ace the Bat dog and finally is a Batman/Swamp Thing crossover issue which I thought was tremendous, excellent colouring in particular and the dialogue at times was superb, although there was a bit more repetition to put up with. 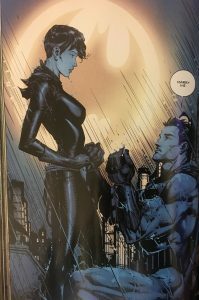 Also included is a short Batman/Catwoman issue with a huge cliffhanger which could change absolutely everything in the Batman universe from that moment onwards. A cliffhanger of such proportions that I won’t go into any detail in case I spoil it. I didn’t like it. 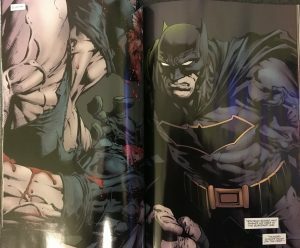 Throughout Batman Rebirth the art work as been nothing short of fantastic and is the highlight of the series so far for me, the colouring, straight lines and graphic detail of every blow and bruise that the characters face is immersive. The art in Rebirth has been some of the best I have ever seen in a Batman comic and helps a lot when trying to get over some of the odd writing and dialogue. If you look online for other I am Bane reviews you’ll see it’s quite polarising. Adventures in poor taste loved it whereas Chelsea on Goodreads hated it. Personally, I thought it was OK and disappointed how it could have been better with the premise it had. Art work was exceptional, the general plot line was good even if the motives of the characters, particularly Batman were bizarre, the dialogue stringing it together was terrible at times. So far in Rebirth it feels like Tom King is trying too hard to keep fans happy and in Volume 3 he has been trying his hardest so far. Since Volume 1-3 so far were somewhat tied together, I hope with Volume 4 and onwards a new arc will begin with fresh ideas, characters and a plot line. I do feel like Tom King is capable of greatness and as a Batman fan I am not about to abandon the character.